I wonder what your story is. what are the events that have shaped your life, made you who you are? These are things I wonder. And today I had one of those wondering moments. Today was a beautiful summer day, over 90 degrees!, and I decided to tackle that task know as 'cleaning the car'. It needed it...bad! So, while sunblock-coated me was outside car cleaning, a deep rumbling sound hummed in my ears, growing increasingly louder, and it wasn't the sound of the vacuum cleaner! 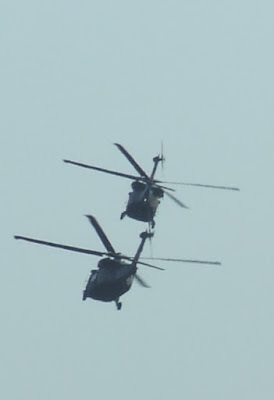 I looked up to the sunny blue skies and found my answer: two very low flying Blackhawk helicopters were fast approaching. Shielding my eyes, I watched them fly right over head (literally), close enough I imagine I could almost make out a human form through the windows. See I'm a romantic. A dreamer. Sometimes just *a bit* unrealistic. Anyone else know what I'm talking about?! And...well...I couldn't help wondering about the men who occupied that cockpit. What had they seen in their time of service?